Heartland RV has long been known to be a leader in the fifth wheel market. 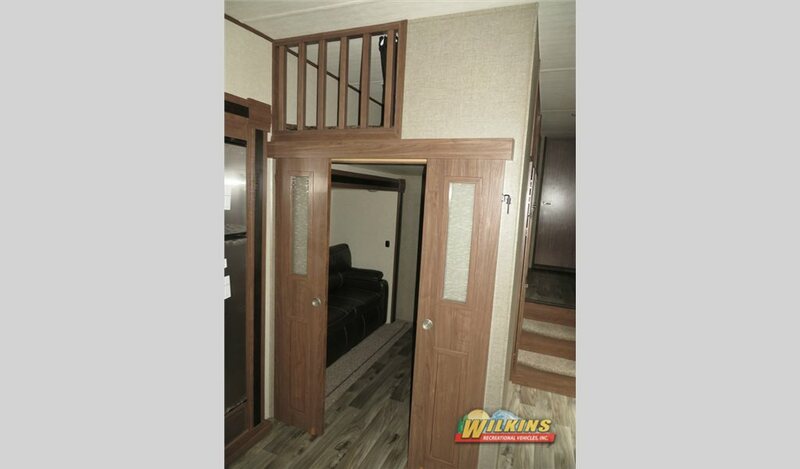 Brands such as the Heartland ElkRidge Fifth Wheel demonstrate why this manufacturer deserves so much respect. The elegant interiors of the ElkRidge are loaded with premier fabrics, stunning glazed chestnut cabinets, oversized leather recliners and a spaciousness that will impress even the most discerning customer. 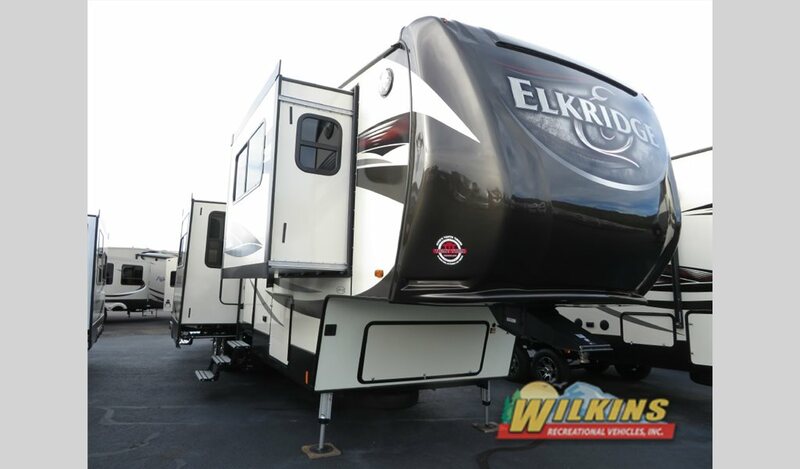 ElkRidge models are available in double, triple, quad, or five slide outs maximizing the interior space depending on your needs. 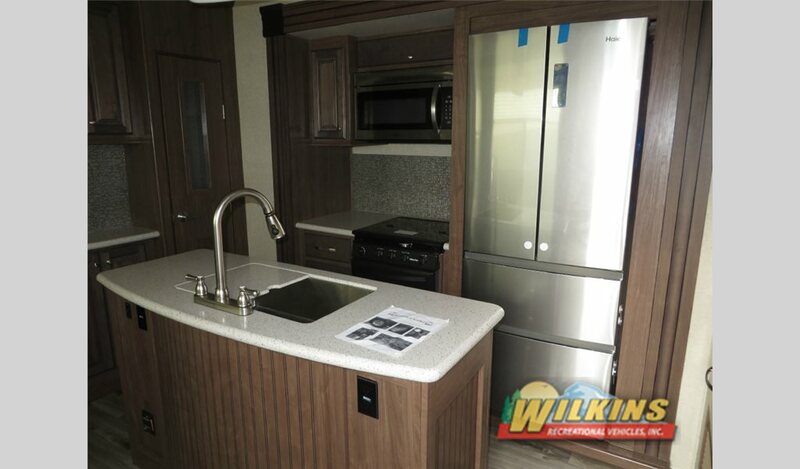 Luxury features are everywhere you look in this top notch Heartland Fifth Wheel. From the electric fireplace to the Amish crafted cabinetry, the solid surface counter tops to the LED lighting accents under the kitchen island, these residential additions will make you feel right at home. There are no sacrifices in the master bedroom, either. With a king sized, walk around bed and full wardrobe and dresser storage, you will be amazed at the ElkRidge bedroom’s spaciousness and storage capacity. In the wardrobe, you will find hook-ups for a washer and dryer, as well. Innovative floorplans like the middle den design of the ElkRidge 39MBHS maximize living and sleeping space. 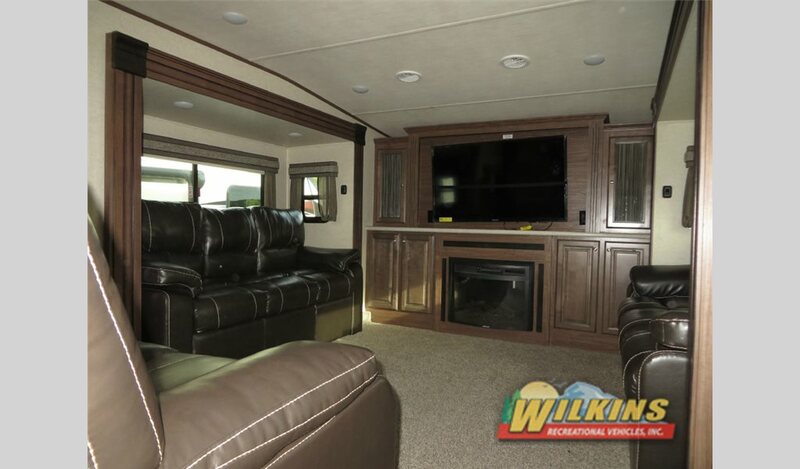 The front living floorplan of the ElkRidge 40FLFS offers an ideal seating arrangement for entertaining. With multiple family members all wanting to use the bathroom at once, having a second bathroom available, as in the Elkridge 38RSRT floorplan, can be a real life saver. When it comes to construction, the ElkRidge is an impressive example of precision attention to detail and skilled craftsmanship. Large, energy saving double-paned windows offer a fantastic view of your surroundings. The 2″ thick laminated sidewall system consists of a double welded aluminum frame, 1 1/2″ thick block foam insulation, double layer of luan which acts as a vapor barrier topped off with a high gloss fiberglass exterior. The universal docking center, automatic leveling system, and magnetic slam latch compartment doors make setting up camp as quick and convenient as possible. 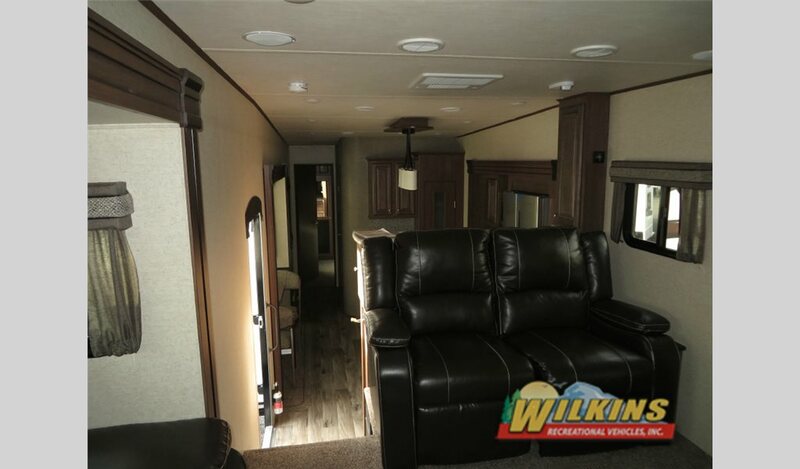 To take a tour of the luxurious Heartland ElkRidge Fifth Wheel, Contact Us at Wilkins RV or visit one of our locations in Bath or Rochester, NY. 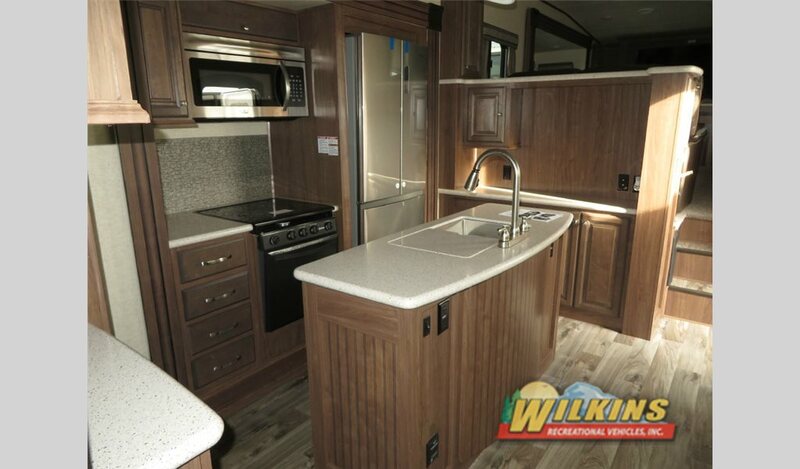 Our friendly RV Specialists are here to assist you in finding just the right RV at just the right price to make your travel dreams come true.